Ibéria – Book I "Evocación"
Ibéria – Book II "Triana"
Estampes – "La soirée dans Grenade"
Préludes Book I – "La sérénade interrompue"
Préludes Book II – "La Puerta del Vino"
What a delightful disc this is! We have all known and admired Stephen Hough for his magnificent prowess at all levels of pianistic achievement but this disc really takes the cake for inventive vigour and originality. Hough begins his Spanish traversal quite logically with those composers that have remained forever etched in that country's history. Soler's short Sonata is a delightful piece whilst Granados' Valse poeticos also come across very beautifully. I particularly enjoyed the four short pieces by Mompou, brilliantly played by Hough. Next come the French neighbours and with Debussy and Ravel, you really can't go wrong for Spanish impressionism. These are rather works apart from Ravel's 'Habanera' which comes alive in Hough's energetic interpretation. 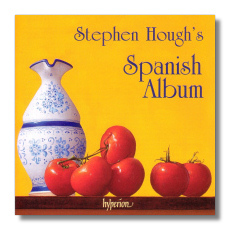 Finally we have an assortment of composers from different countries who paid tribute to Spain including Hough himself. Godowsky, Scharwenka and Niemann recreate that magic marvelously but it is aptly left to the pianist to have the last word. This is truly one of the loveliest piano compilations around and deserves every recommendation.